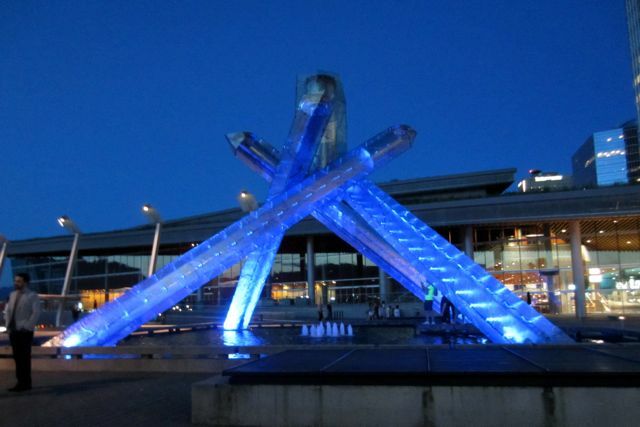 The Olympic Torch on the shore of Vancouver Harbor. A fascinating sculptural site during the day. 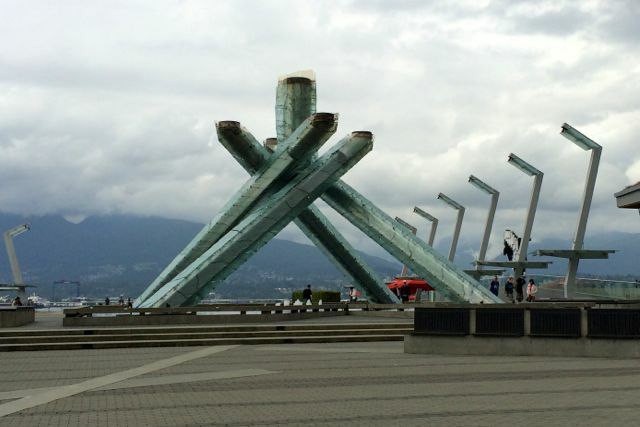 The Olympic Torch at Vancouver Harbor. It looks best in the evening lit up like this. Business Meeting, Business Meeting – Where are you? According to many sources and many of our own personal experiences, we know that the essential purpose of the annual business and membership meeting of an association is to comply with by-laws to show accountability for finances and services provided to the membership. There is typically communication of accomplishments, challenges, and plans for the next few years to strengthen accomplishments and address challenges whether financial, operational or other. This communication demonstrates transparency of operations to all stakeholders and helps to ensure confidence in the management and leadership of the association. The meeting also provides an opportunity for old business to be addressed if anything is outstanding, new business to be brought forward, and a forum for asking questions and clarifications of data presented and actions taken or planned. It also helps raise awareness of all the work done for the membership and shows the association’s value to them. That is all well and good but there was not much of any of that in the SLA2014 annual business meeting in Vancouver. Attendees heard a revival type speech from the treasurer to all work as ‘one SLA’ with a mere smattering of data shown on charts but never spoken. The CEO and president gave well-deserved kudos to SLA staff and volunteer committee members and acknowledged that the SLA HQ building was up for sale. That was essentially it. There was no call for old business, new business, and no opportunity to ask questions at all. So let’s break it down a bit, shall we? First off, I am sure we will be told that much information has been issued in reports or other documents available online. True or not, the audience deserved a summary of key accomplishments and an outline of key challenges and what is being done to address them. We also should hear what was discussed and perhaps voted on in the SLA Board meeting held the day before the conference began. Being told these are tough times brings no added knowledge to those of us willing and dedicated to stay to the end of the conference and attend the business meeting. I recall officially hearing the attendee numbers maybe once or twice in the past few years, so this is NOT a new thing done only by the current Board and SLA HQ and it is a very, very bad trend. Let’s get specific. When the treasurer stood up to give his presentation, the audience saw 3 images of data over about a 20 minute span of time. The first was a map of the world sectioned to represent the chapters and that was an interesting graphic but didn’t tell us a whole lot. The second was a graph showing membership numbers in steady decline over the last few years where we are currently hovering around 8,000 members. At one time we had a membership of around 14,000 so that gives you an idea of the difference today. The third image was a graph showing how expenses and revenue compared over the years, with revenue far exceeding expenses a while back but in the most recent past we are barely able to make enough revenue to meet expenses. The treasurer did make a brief comment to that effect with the graph displayed, but that what the extent of the facts we heard or saw at the meeting. * Attendance numbers for the conference – members, vendors, total. Why? The conference is often spoken about as a key annual revenue source for the association. Therefore the numbers of members and the numbers of vendors attending and participating in the conference have a direct impact on the economic health of the association. We as members and vendors cannot fully understand or assist in fixing a declining participation in the conference – or the association for that matter – when the facts are kept from us. Given that the business meeting is held at the end of the conference, the SLA staff clearly have those numbers handy. This is not the first time this has happened, so it more than the current Board and SLA Staff to call to question. Be assured I feel the conference itself was extremely productive for me in many ways for my library and institution from a business standpoint, for me professionally in enhancing my awareness of what others are doing that I could do as well, knowledge of products and services, as well as for me personally in being able to see my many friends and colleagues and meet new ones. 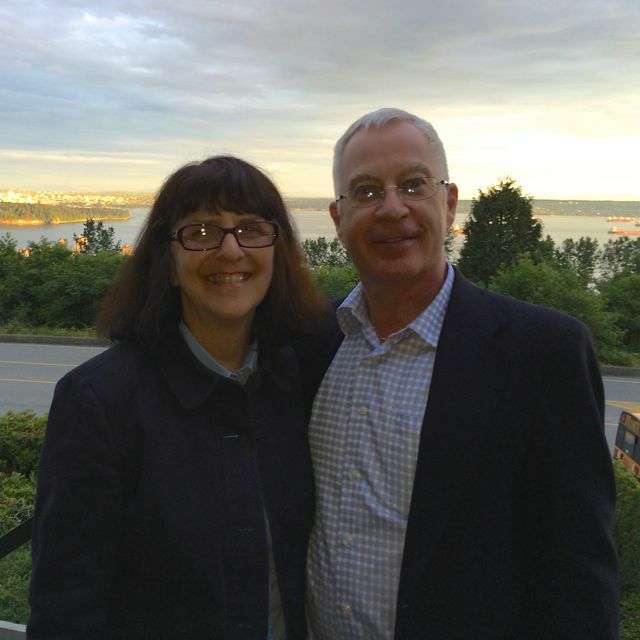 SLA Past President Deb Hunt and me checking out the scenery during a fun dinner across the bay from Vancouver. So here is my anecdotal observation until we get an apparently forthcoming ‘first annual report’ to the membership, according to the Treasurer. Despite the lack of room availability in conference hotels near the ‘action’ due to being ‘sold out’, there appeared to not be a huge amount of membership attendees at this conference. I know the U.S. Government employees were unable to travel internationally, so that was one of perhaps a few key reasons. Nonetheless, I can recall in past years jostling through a crowd at the INFO-EXPO opening and it was a smaller crowd this time for sure. While walking around the INFO-EXPO exhibit hall (ah, the questionable on-going need for a conference center exhibit hall — a topic I shall speak of again at another point) there was at least one entire aisle that was empty, there were several empty stalls to the back of each row of exhibit booths, and there were a number of ‘table top’ exhibits instead of full booths. It wasn’t as cavernous a feel as it was in Chicago or San Diego, but still felt a bit sparse. While thanking the vendors for their participation and getting good information on their products and services, I asked them about the customer traffic and their general opinion about the space and all. Many were very happy with the people they met and the business discussions, but said they did feel the traffic flow to be on the light side with few examples of large crowds at any one time. One vendor who has participated for years indicated that he felt SLA was ‘running on fumes’ and has been for a few years. He assured me that his organization would participate in the annual conference as an exhibitor through whatever SLA goes through even if it is to an endpoint – an endpoint that he thinks could come in a few short years or less. He thinks there is a core 20 or 30 vendors that would do that as well because of their loyalty to their customers and SLA. And for those of you who think you know who this vendor is, you would be wrong as it is someone else for sure. Mind you, I know of several vendors who did not exhibit this year at all but did attend the conference. At least one significant vendor had their CEO in attendance and likely conducted individual meetings rather than exhibit. Hmmm… was that because of the booth expense, their own interest in cutting general travel and conference expenses, or ??? * Financial summary of the Association. Are we in a deficit (what time of day is it? ), barely meeting expenses – apparently so, or making money (nope!). Many of us have budgets and run a ‘business’ so we can appreciate the challenges of revenues and expenses. We also know we work hard with our colleagues and senior management in our workplace to get things done with the limited resources available. So, stop playing shadow puppets and give us the skinny on the numbers! To hear a member of the Finance committee tell me in a side conversation at another point in the conference that we are barely squeaking by to meet expenses and had to make tough decisions on what to fund was enlightening but that should have been said by the SLA Treasurer, the CEO and/or the current President. * The SLA HQ staff situation and what is really going on at SLA HQ – The CEO thanked her hardworking staff for their efforts in getting yet another conference accomplished. They are amazing indeed and we hear there are fewer of them, but this year we have no idea how many or the challenges. I recall that was addressed in more detail in the past and helped us understand the complexity and effort required to make the conference happen. Many niceties were expressed by the CEO about cooperation of her and her team with the SLA Board of Directors and conference planners. She also mentioned the sale of the HQ building but that’s it – mentioned it. What else is going on with SLA HQ? How is the Association faring as compared to others? We know ALA has lost members as have many others. What does the ASAE membership say about their organizations? Inquiring minds want to know if we are an anomaly (doubt it) or one of the many in a crowd of struggling associations? As an aside, it would have been nice to have a conference program booklet with all the maps of the conference center and hotels included. The Convention Center map was printed in the larger special conference edition of Information Outlook and there were no maps of the hotel locations or meetings held in them. * The status of the sale of the SLA HQ building and the plans for the expected revenue from the sale. Oh, it was mentioned by both the CEO and President, but that’s it – mentioned. The sale is happening, though maybe not be able to close a deal for a long while, and there are lots of discussions about it but we aren’t going to update you on it here. Many of you are not privy to the SLA Leadership or LMD discussion list where many questions and answers were posed, but there was a dissemination of a summary through e-mail. It’s a hot topic and we don’t want to discuss it further and no, you can’t ask questions here even though this would be the place for you to do so. Nope, waste of time, can’t do it, won’t let you, so don’t try. In fact, we won’t even provide a Q&A part of the meeting so you can’t! — How can you have a “business meeting” with no questions by the membership about the very topics presented or absent? It’s been a few days since returning from the conference but it is only now I feel like I was given a date drug and sent on my way before realizing we didn’t have an actual business meeting but rather a series of presentations and platitudes. This has to change. Up next: SLA: How YOU Doin’? Part 3: Fact, Fiction or Political Nuance? We Are Professionals?